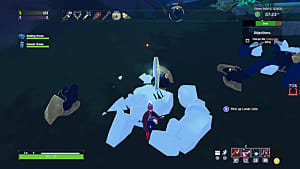 Risk of Rain 2 stealth released via the Gearbox PAX East panel last week. It was a little shocking to see a sequel to a little indie gem being shown off on such a public stage, but also immensely refreshing. Risk of Rain was made in GameMaker Studio and published by Chucklefish. It was also a fully 2D game with a lovely pixel art aesthetic and some astoundingly good music. The sequel is different, but not in any way that detracts from it. This time, it is a fully 3D game developed in Unity. Having seen some footage of it a year or so ago, I was a little worried. After all, seeing a game you love taken in a bold new direction is simultaneously exciting and terrifying. What if in the process the heart of the game is lost, what if it loses that special something that made it so enjoyable? 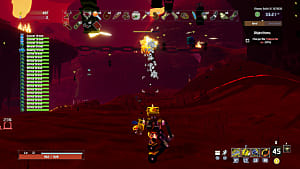 Well, it turns out that adding that extra dimension has turned Risk of Rain 2 into an outstandingly good experience, and it is still only in Early Access. The sense of scale in the levels is truly vast. There are still secrets tucked away at the end of hidden paths, it's just that this time, you need to be willing to try and scale the side of a mountain to get to them. It is still the roguelike game it has always been, too. 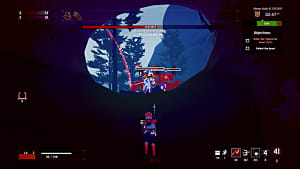 Your aim is still to shoot, hit, or use special abilities to defeat enemies as they try to overwhelm you; most of the time, you're doing this from a third-person perspective. At lower difficulties, the combat is enjoyable; it's a matter of just trying to collect the items you need to be overpowered and lay waste. At higher difficulties, it becomes a bullet hell that requires every iota of focus you can muster just to survive. Although, if you stay on easy long enough, you will eventually reach the dizzying heights of the "Hahahahahahahaha..." difficulty. That's because the difficulty in Risk of Rain 2 is fluid. The difficulty you choose at the beginning of your run merely dictates the speed at which you will progress through the actual difficulty. 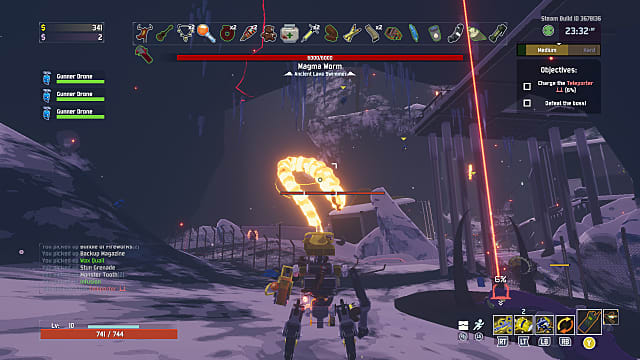 For example, if you choose Monsoon difficulty at the beginning, you can expect to reach the final difficulty setting far quicker than is comfortable. It is a system that inherently asks you to weigh which is more important; is it better to grind out money to open chests for the chance to get better items, or is it better to simply rush through to keep the combat manageable? Each run is likely to end with you dying and having to start again, but that is all part of the fun in a roguelike, after all. At present, there are six characters to choose from, though only one is available initially. You unlock the others as you go. 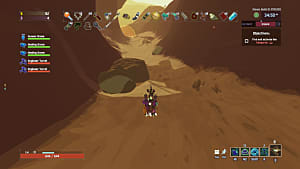 While other games may have characters with slightly different stats, Risk of Rain 2 has entirely different playstyles built into each of your choices. Take Mul-T for example, a building site robot who has two weapons instead of one, and who can hold two usable items at once, instead of the usual one. Instead of relying on one playstyle and being exceptional at it, they are better suited to adapting to the current situation. Long-range fights can be fought with your slow-firing but very powerful sniper weapon. Close-range battles call for your inaccurate machine gun. No other character is this adaptable. This type of adaptability makes your choice important, but it also makes the game feel fresh when playing as another character. 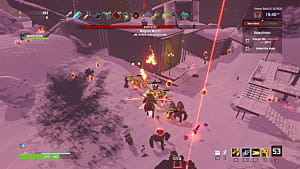 Risk of Rain 2 is already a truly stellar sequel to an already outstanding first attempt. 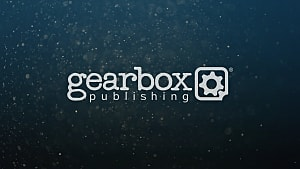 It feels polished, the gameplay is potentially unending, and the co-op gameplay is flawless, the latter of which is perhaps the thing that elevates the game to such heights. Simply join a friend's lobby before starting a game and off you go. 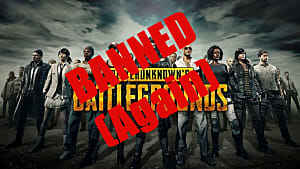 You can even play with a team of four for a more chaotic experience. Unfortunately, co-op is online only at present. 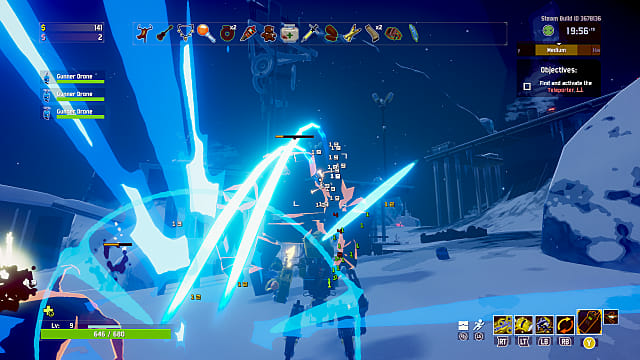 The fact that all of this exists within an Early Access game speaks volumes about what to expect going forward. 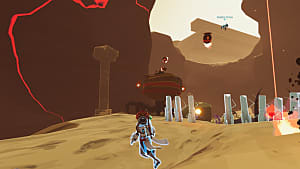 It is quite simply a huge amount of fun, and when you consider the stream of content that is no doubt rushing toward us, it is well worth getting into Risk of Rain 2 now.